...And it taught me to face my fears. Solo travel is about having time for and with yourself. 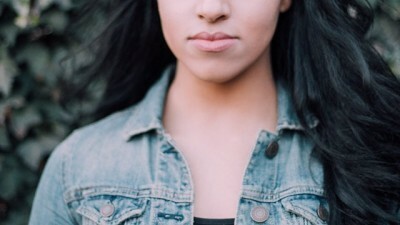 City noise can often muffle your inner voice, and journeying out of your comfort zone can help you listen and trust it a little more. You don't need to immediately hop on a plane and go miles away from home. 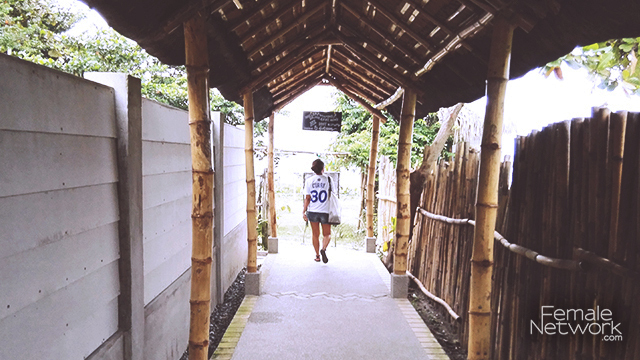 You can start by taking a bus to a quick getaway such as La Union. 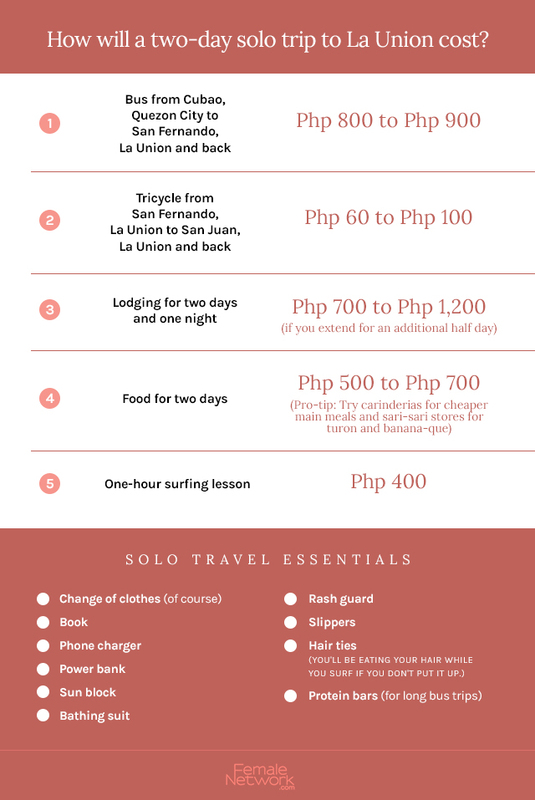 Located in the Ilocos region, La Union is home to the best surfing spots in the Philippines. In fact, it's considered one of the safest tourist destinations in the north, so much so that surfers just leave their boards at the beach for days. It's a good jumping off point for women who are planning to sojourn on their own, thanks in part to the locals go out of their way to make their visitors feel right at home. That being said, I was initially iffy about this solo trip. Don’t get me wrong, I’ve flown on my own both in and out of the country before, but I’ve always arranged to meet with a friend or a relative. That gave me a sense of certainty. This trip, however, was all about heading alone in a place where I knew no one, and without an itinerary to boot. 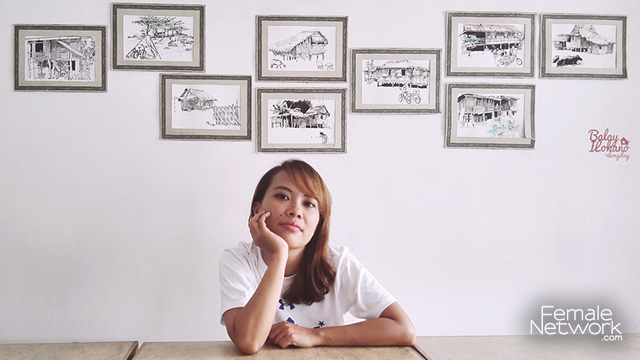 I’m a through-and-through city girl who likes everything planned, and the fact that this short trip would push me to face the unexpected unnerved me. I packed a two-day bag and got me a bus to the north. I booked my Partas bus tickets online via Biyaheroes. I got to the Cubao terminal early and waited until my scheduled ride pulled up at around 9AM. 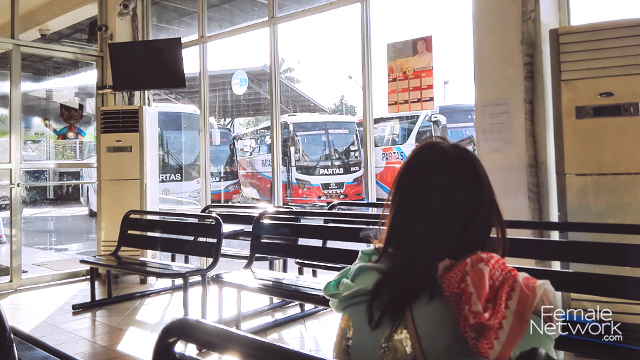 The bus itself was comfortable enough, and I managed to get me a few good hours of sleep—that was until I realized that the supposed five- to six- hour trip was taking way too long. After disembarking at the Partas terminal along MacArthur Highway and riding a tricycle to San Juan, I arrived at Flotsam and Jetsam at around 6:30 in the evening – that’s a total of nine hours of travel. “Where have you been?” the receptionist asked. It took me completely off-guard, but oddly, it also made me feel better about the grueling trip getting there. I checked in, left my stuff in my dorm (more on that later), and proceeded to get my first hot meal of the day. 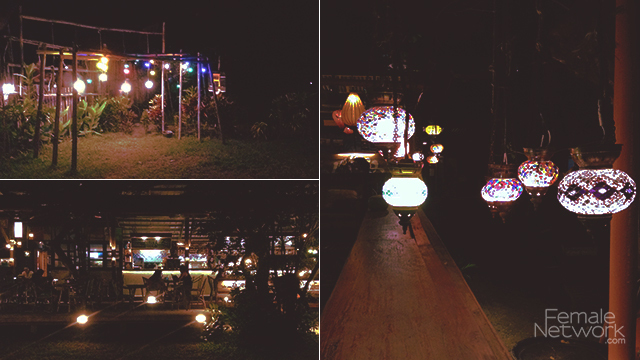 Flotsam's KitchenBar was full of young men and women in fancy beachwear that night, drinking and having a good time. I, on the other hand, was a weary traveler in stinky clothes who hadn’t had a decent meal the entire day. I ordered their chicken tinola, and it was by far one of the best I’ve ever had. I would have taken a photo of it, but I was so hungry that I immediately scarfed everything down. The tinola’s broth was packed with malunggay leaves and ginger strips, and the chicken was so soft and well-cooked that it would remind you of your lola’s cooking. The rice was topped with friend chicken skin strips, and their saltiness was a perfect combination to the richness of the broth. Needless to say, it was the highlight of my day. After a quick bath in the common shower area, I went to bed dead to the world. I woke up early the following morning and decided to take a good look around the hostel. 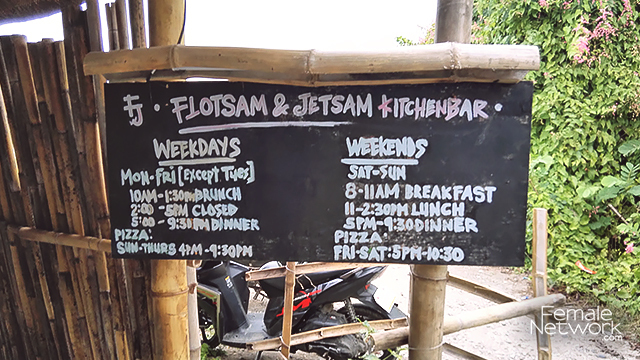 Flotsam and Jetsam Artist Beach Hostel touts itself as your home away from home. 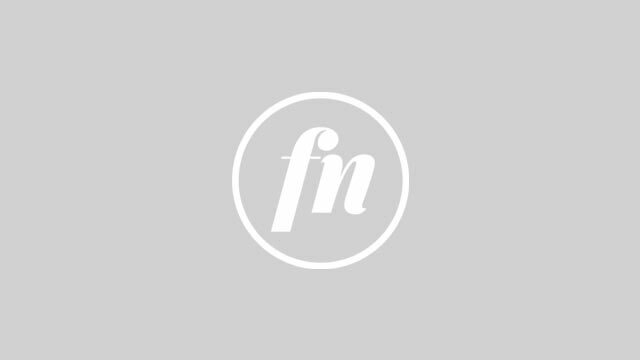 With a very friendly staff who you can actually chill with, it offers different accommodations depending on your budget, which makes it a very flexible stop-over for people from all walks of life. 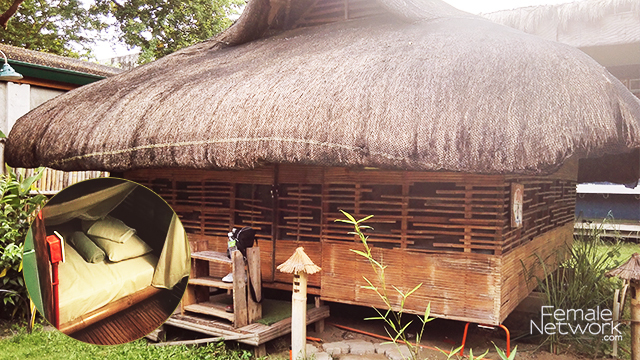 I stayed in one of their eight-bed bamboo hut kubo dorms, which felt very private for a shared dorm. I had a tabing, a kulambo, a cabinet with a lock where I can keep my belongings, and even my own electric fan. I also had a dorm mate, whom I ended up jiving with over breakfast. 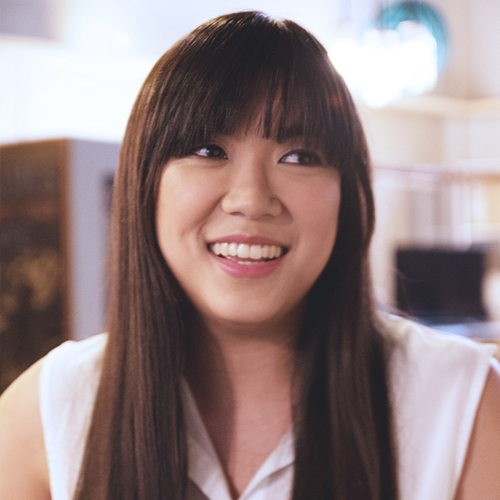 She introduced herself as Sonia Arriba or Sonj, a Cebuana banker in her late twenties who was also traveling on her own. Outgoing and outspoken, she told me that every year for the past three years, she would go to La Union and surf to celebrate her birthday. It was also her first time to travel alone. “Panindigan ko na,” she told me. We immediately hit it off. She was also the one who convinced me to try surfing. After breakfast, we made our way down to the beach. The guys from Badz Surf School were laid back and accommodating. 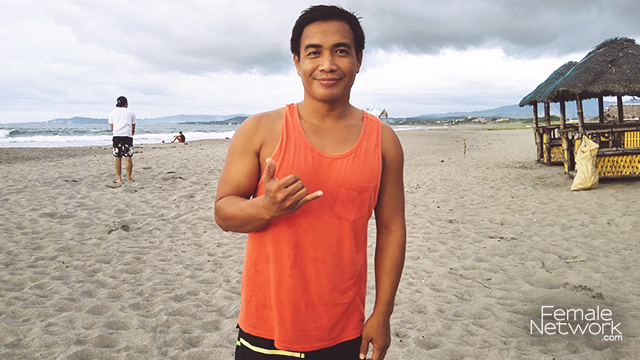 Owner Arnel “Badz” Badang taught me the basics of surfing, and I first practiced the technique on sand. By then, my heart was pounding and my head was screaming. What the heck am I trying to do? You see, I’m afraid of huge waves and deep waters. I know how to swim, but I almost drowned once before, which got me pretty shaken up. 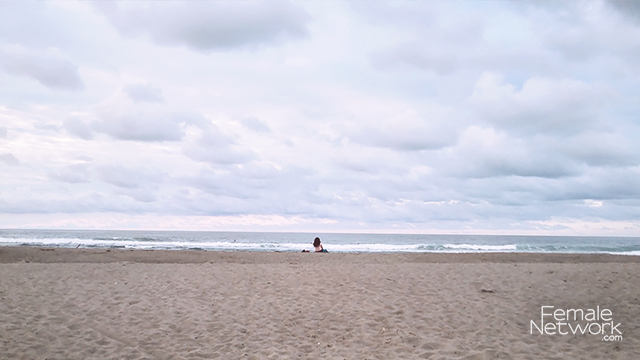 While I enjoy calm shores like those in Palawan, I didn’t like the unpredictability of La Union’s rough seas. I always wanted to be sure of outcomes and the sea is anything but certain, so my instincts were going haywire as Coach Badz handed me over to Coach Larry Munar, who led me to the waters. That was when I started panicking. During my first few minutes in, I got hit by a set of strong waves that sent my board flying over the curl and slamming onto the surface. I was fighting for breath and every time I tried to compose myself another wave would hit my face. From an observer on the shore my fear would seem funny, but for me it was very real. I was hyperventilating, and I could hear my heart pounding in my ears. “Magtiwala ka lang sa sarili mo,” Coach Larry said. It was so cheesy, but I felt tears started to form in my eyes. I hated myself for being so dramatic and hoped hard that the spray covered the fact that I was crying. For the span of almost an hour, Coach Larry talked to me non-stop, encouraging me that fear was only in my head, and that it was possible for me to trust him, myself, and the sea. He almost drowned once too, he shared. Everything was a risk, but life held no meaning for him if he didn’t jump in. As for me, he saw that I could learn if I wanted to. I just needed to let go. “Hindi ka pababayaan ng dagat,” he told me. When he saw that I was feeling better, he took me to the lineup to wait for my first wave. It didn’t take too long for it to arrive. 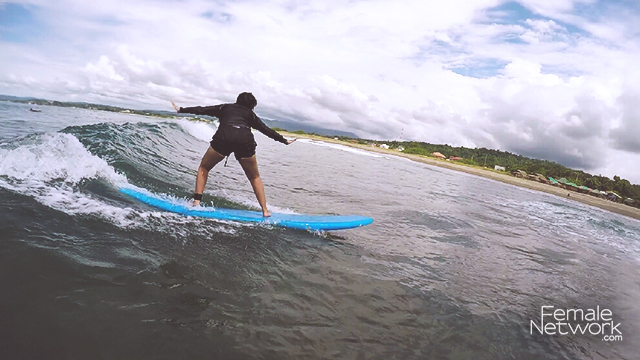 I released my grip on the board and going against my instincts that were screaming for me to hold on, I let go, pushed myself up, and all of a sudden I was standing while being propelled forward by the waters. It only lasted for a measely three seconds, but I could hear the entire shore hooting and clapping. Apparently, all those who were surfing that day witnessed my drama, and while it was very embarrassing to admit that I had been crying in the middle of the sea, the support of Sonia and of people I didn’t even know helped me face my fears. After a late lunch in a restaurant near Flotsam, Sonia and I went back to Badz Surf School to hang out with the coaches. 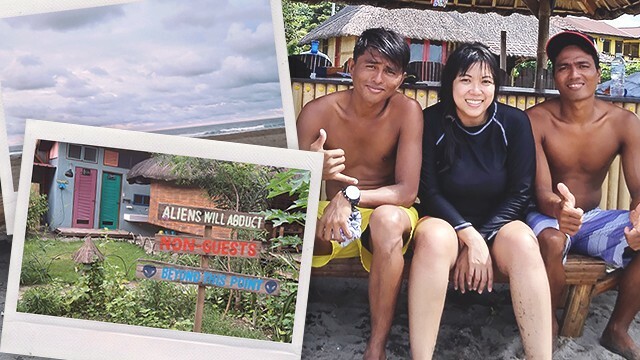 Coaches Badz, Larry, and Kelvin each had their tales of how surfing changed their lives and how living with just the basics could be more fulfilling than living with too much. As Sonia and I left for an early dinner (I recommended Flotsam’s tinola, of course), I thought of how comfortable I was in my safe space that maybe I was missing out on a lot of things. I would plan my life so much that I would forget that spontaneity had its perks, and that most memories that were worth reliving were those of things that I least expected to happen. When you open yourself to the unexpected, beautiful things happen, and you become a person who’s slightly wiser and more courageous than who you were before you began your journey.